We had a chance to talk to Western Digital last week about a new hard drive technology they have coming down the pipe called Advanced Format. Ahead of the impending launch of the first Advanced Format drives, Western Digital is engaging in an education campaign about the technology, as it represents the first step in a general transition for hard drives, and is a transition that can’t be done completely behind the scenes. Specifically, Advanced Format is going to bring about some issues where older operating systems (and we’re looking almost exclusively at Windows XP here) will inadvertently harm drive performance by making certain assumptions about the drives that will no longer be true. We’ll get in to the nitty-gritty about the impact of this in a bit, but first let’s start with Advanced Format. What is it? In a nutshell, it’s replacing the traditional 512 byte hard drive sector with a 4 kilobyte (4,096B) hard drive sector for a number of practical and technological reasons. Advanced Format is the name Western Digital is giving to drives implementing 4KB sectors. The move to 4K-sectors has been some 10 years in the making, as research in the late 90’s identified that 512B sectors made less and less sense as drives continued to get larger. At a time when hard drives were measured in megabytes, 512B sectors were a good balance between technical factors and a desire to keep wasted space at a minimum (you can’t normally put 2 files in 1 sector), but times have changed and hard drive capacities are several orders of magnitude larger. The crux of the problem is that there are 3 factors that are in constant need of balancing when it comes to hard drive design: areal density, the signal-to-noise ratio (SNR) in reading from drive platters, and the use of Error Correcting Code (ECC) to find and correct any errors that occur. 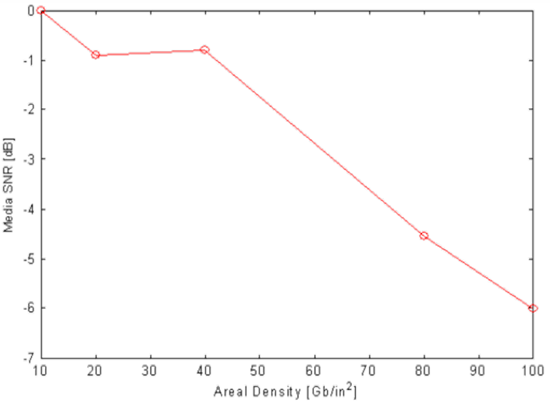 As areal density is increases, sectors become smaller and their SNR decreases. To compensate for that, improvements are made to ECC (usually through the use of more bits) in order to maintain reliability. 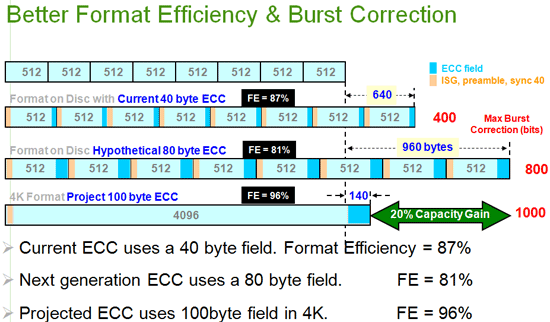 So for a drive maker to add more space, they ultimately need to improve their error-correction capabilities, which means the necessary ECC data requires more space. Rinse, wash, repeat. At some point during this process drive manufacturers stop gaining any usable space - that is, they have to add as much ECC data as they get out of the increase areal density in the first place - which limits their ability to develop larger drives. Drive manufacturers dislike this both because it hinders their ability to develop new drives, and because it means their overall format efficiency (the amount of space on a platter actually used to store user data) drops. Drive manufacturers want to build bigger drives, and they want to spend as little space on overhead as possible. But all is not lost. The principle problem here is that ECC correction takes place in 512B chunks, while ECC can be more efficient when used over larger chunks of data. If ECC data is calculated against a larger sector, even though more ECC data is necessary than for a single 512B sector, less ECC data than the sum of multiple sectors is needed to maintain the same level of operational reliability. One estimate for 4K sector technology puts this at 100 bytes of ECC data needed for a 4K sector, versus 320 (40x8) for 8 512B sectors. Furthermore the larger sectors means that larger erroneous chunks of data can be corrected (burst error correction), something that was becoming harder as greater areal densities made it easier to wipe out larger parts of a 512B sector. As a result, the need for the larger sector is born. As for why Western Digital and other drive makers are transitioning specifically to a 4K sector, the rationale is based on the earlier problems. 4K sectors are much larger than 512B sectors, which means they benefit more from our earlier ECC optimizations, which in turn brings a greater increase in format efficiency than using smaller sectors (i.e. 1K). 4K also happens to be a magical number elsewhere when it comes to computers – this is primarily rooted in the fact that a normal page of memory on an x86 processor continues to be 4KB (ed: 4MB pages also exist). 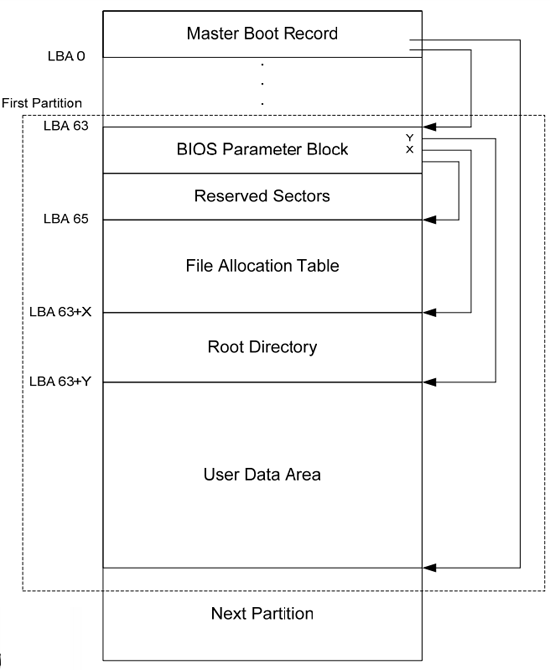 The x86 page size in turn has also lead to file system clusters (the smallest unit of storage in a file system) becoming 4KB as 4KB clusters neatly fit in to a page of memory, while the need for smaller clusters has subsided amidst a general increase in file size (i.e. fewer files are smaller than 4KB and waste space). NTFS, EXT3, and HFS+ all default to 4KB clusters on modern hard drives. So 4KB physical sectors map perfectly with 4KB file system clusters, which in turn map perfectly with 4KB memory pages. And hence 4KB is the largest practical size for a hard drive sector at this time. So what’s the net benefit from all of this for consumers? At the moment, not a lot, which is why this is a low-key launch for Western Digital, and the focus of this is an education effort on what the use of 4K sectors means for older operating systems. The biggest benefit is going to be that this will enable Western Digital to more easily design drives over 2TB in size. From a numbers perspective, Western Digital estimates that the use of 4K sectors will give them an immediate 7%-11% increase in format efficiency. ECC burst error correction stands to improve by 50%, and the overall error rate capability improves by 2 orders of magnitude. In theory these reliability benefits should immediately apply to all 4K sector drives (making the Advanced Format drives more reliable than regular drives), but Western Digital is not pushing that idea at this time. With all of that said, to make this kind of advancement practical, a transition period is necessary. That transition period will be done through the use of 512B emulation technology, which will expose Advanced Format drives to the drive controller and operating system as having 512B sectors, when in reality they will have 4K sectors. Unfortunately, this method has a downside, which is the ultimate reason for Western Digital’s education campaign. With the emulation of 512B sectors, there’s the risk that a partition could be misaligned compared to the 4K physical sectors - where it would be unwittingly started in the middle of such a sector. As a result, the clusters of a file system on that partition would end up straddling 4K sectors, which would cause performance problems. Specifically, in testing IDEMA (the drive manufacturers’ trade group) found that random writes in would be particularly impacted, as a Read-Modify-Write(RMW) would need to take place to update each sector, rather than a straight write(ed: This is very similar to writing to a dirty block on a SSD). Although this isn’t mechanically/electronically harmful in any way, the performance hit compared to a straight write makes it undesirable. Though this article says that drives with EARS in the drive model (eg. WD10EARS) will have 4k sectors, just a quick calculation from the drive specs on the WD website seems to indicate that these drives still have only 512B sectors. The drives "pretend" to be 512 bytes per sector-drives, but are really 4 KiB sector-drives. I am, as many here, a technology entusiast. From my point of view, the big mistake was to use the 7 and 8 pin's jumper for XP workaround and sector shifting. There is WD align utility that solves the issue for old good XP. Now 10% of users will decide that two medicines will work even better than one, so they will both install the jumper, and then align the partitions with some aligment tool. Or, the users will get their systems shipped with XP and jumper installed, and later will upgrade to Windows7. What will happen? In all these cases users will get a 50% decreased performance and drive weared out earlier than necessary due to many read-change-write cycles. These PINs should been used to just enable native 4KB sectors when pin removed! So anyone with Vista or later OS and NEW PC (with 4KB aware BIOS) can simply take out the jumper and enjoy knowing that now it works in native 4KB. I would even put the default at 4KB. And put a big warning - XP and older OS users please install the jumper and run the utility after OS installation! The only limitation would be that if upgrading OS the additional operation is needed - to remove jumper, and then install clean Windows7. Majority of users will be upgrading this way anyway. And going forward it would just be less and less users who need the "XP jumper". I am suprised who is taking a product decisions on WD. They release external disks with built-in SmartWare (many users called it CrapWare) that always pop-up as CD letter, and there is no way to have just a clean drive without space wasted for software of no use (most recent firmware allows to disable pop-up CD but users need to flash new firmware to the USB drives). And now... they release good new 4KB technology and there is NO WAY (no jumper) to just pass 4KB on interface?